Known as the "Endecott Charter," the parchment came to Naumkeag (now Salem) on June 23, 1629. With the Charter in hand, John Endecott became governor of the newly-established Massachusetts Bay Colony. King Charles I had signed two copies of the official charter - the first taken to Cambridge, England, to be discussed by the puritan founders, and the second sent to the colony itself as authorization. 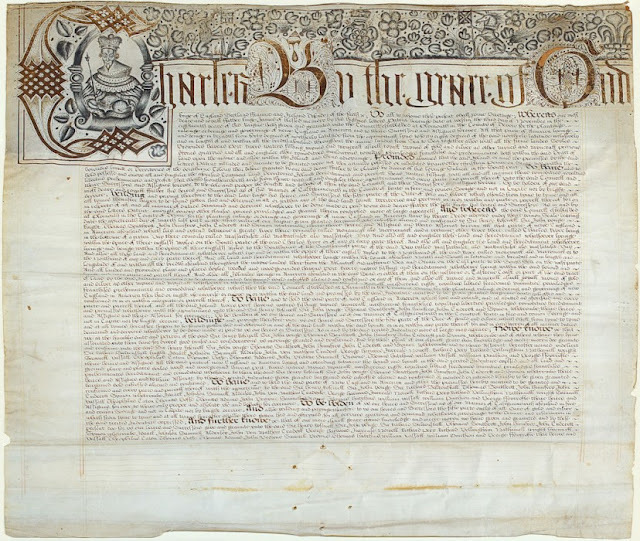 It was the first such charter to arrive in British North America. 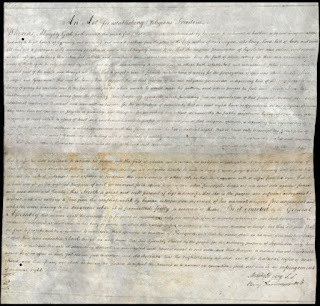 Significantly, the four sheets of parchment represented a documentary basis for American self-government.The Massachusetts Bay Charter was considered the official governing document for almost 56 years, until it was made null and void by a court case in 1684 and Massachusetts fell under the Dominion of New England and Sir Edmund Andros' reign. 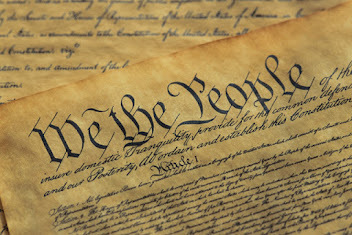 The Endecott Charter was held by the Saltonstall family for many years, until June of 1810. At one of the first meetings of the Salem Athenaeum, Leverett Saltonstall gifted the Charter as a founding manuscript of the Athenaeum's collections. (Peabody Essex Museum). NOWE Knowe Yee, that Wee, at the humble Suite and Peticon of the saide Sir Henry Rosewell, Sir John Younge, Thomas Southcott, John Humfrey, John Endecott, and Simon Whetcombe, and of others whome they have associated vnto them, HAVE, for divers good Causes and consideracons, vs moveing, graunted and confirmed, and by theis Presents of our especiall Grace, certen Knowledge, and meere mocon, doe graunt and confirme vnto the saide Sir Henry Rosewell, Sir John Younge, Thomas Southcott, John Humfrey, John Endecott, and Simon Whetcombe, and to their Associatts hereafter named; (videlicet) Sir Richard Saltonstall, Knight, Isaack Johnson, Samuel Aldersey, John Ven, Mathew Cradock, George Harwood, Increase Nowell, Richard Perry, Richard Bellingham, Nathaniell Wright, Samuel Vassall, Theophilus Eaton, Thomas Goffe, Thomas Adams, John Browne, Samuell Browne, Thomas Hutchins, William Vassall, William Pinchion, and George Foxcrofte, their Heires and Assignes, all the saide Parte of Newe England in America, lyeing and extending betweene the Boundes and Lvmytts in the said recited Indenture expressed, and all Landes and Groundes, Place and Places, Soyles, Woods and Wood Groundes, Havens, Portes, Rivers, Waters, Mynes, Mineralls, Jurisdiccons, Rightes, Royalties, Liberties, Freedomes, Immunities, Priviledges, Franchises, Preheminences, Hereditaments, and Comodities whatsoever, to them the saide Sir Henry Rosewell, Sir John Younge, Thomas Southcott, John Humfrey, John Endecott, and Simon Whetcombe, theire Heires and Assignes, and to their Associatts, by the saide recited Indenture, given, graunted, bargayned, solde, enfeoffed, aliened, and confirmed, or mencoed or intended thereby to be given, graunted, bargayned, sold, enfeoffed, aliened, and confirmed: To HAVE, and to hould, the saide Parte of Newe England in America, and other the Premisses hereby mencoed to be graunted and confirmed, and every Parte and Parcell thereof with the Appurtenuces, to the saide Sir Henry Rosewell, Sir John Younge, Sir Richard Saltonstall, Thomas Southcott, John Humfrey, John Endecott, Simon Whetcombe, Isaack Johnson, Richard Pery, Richard Bellingham, Nathaniell Wright, Samuell Vassall, Theophilus Eaton, Thomas Gode, Thomas Adams, John Browne, Samuel Bromine, Thomas Hutchins, Samuel Aldersey, John Ven, Mathewe Cradock, George Harwood, Increase Nowell, William Vassall, William Pinchion, and George Foxcrofte, their Heires and Assignes forever, to their onlie proper and absolute Vse and Behoofe for evermore; To be holden of Vs. our Heires and Successors, as of our Mannor of Eastgreenewich aforesaid, in free and comon Socage, and not in Capite, nor by Knights Service; AND ALSO YEILDING and paying therefore to Vs. our Heires and Successors, the fifte parte onlie of all Oare of Gould and Silver, which from tyme to tyme, and aft all tymes hereafter shalbe there gotten, had, or obteyned for all Services, Exaccons and Demaundes whatsoever, according to the Tenure and Reservacon in the said recited Indenture expressed. PROVIDED alwayes, That yf the said Landes, Islandes, or any other the Prernisses herein before menconed, and by theis presents, intended and meant to be graunted, were at the tyme of the graunting of the saide former Letters patents, dated the Third Day of November, in the Eighteenth Yeare of our said deare Fathers Raigne aforesaide, actuallie possessed or inhabited by any other Christian Prince or State, or were within the Boundes, Lymytts or Territories of that Southerne Colony, then before graunted by our said late Father, to be planted by divers of his loveing Subiects in the south partes of America, That then this present Graunt shall not extend to any such partes or parcells thereof, soe formerly inhabited, or lyeing within the Boundes of the Southerne Plantacon as aforesaide, but as to those partes or parcells soe possessed or inhabited by such Christian Prince or State, or being within the Bounders aforesaide shal be vtterlie voyd, theis presents or any Thinge therein conteyned to the contrarie notwithstanding. To HAVE and hould, possesse and enioye the saide partes of New England in America, which lye, extend, and are abutted as aforesaide,and every parse and parcell thereof; and all the Islandes, Rivers, Portes, Havens, Waters, Fishings, Fishes, Mynes, Myneralls, Jurisdiccons, Franchises, Royalties, Liberties, Priviledges, Comodities, and Premisses whatsoever, with the Appurtenances, vnto the said Sir Henry Rosewell, Sir John Younge, Sir Richard Saltonstall, Thomas Southcott, John Humfrey, John Endecott, Simon Whetcombe, Isaack Johnson, Samuell Aldersey, John Yen, Mathewe Cradock, George Harwood, Increase Noweil, Richard Perry, Richard Bellingham, Nathaniell Wright, Samuell Vassall, Theophilus Eaton, Thomas Gofle, Thomas Adams, John Browne, Samuell Browne, Thomas Hutchins, William Vassall, William Pinchion, and George Foxeroft, their Heires and Assignes forever, to the onlie proper and absolute Vse and Behoufe of the said Sir Henry Rosewell, Sir John Younge, Sir Richard Saltonstall, Thomas Southcott, John Humfrey, John Endecott, Simon Whetcombe, Isaac Johnson, Samuell Aldersey, John Ven, Mathewe Cradocke, George Harwood, Increase Noweil, Richard Pery, Richard Bellingham, Nathaniell Wright, Samuell Vassall, Theophilus Eaton, Thomas Goffe, Thomas Adams, John Browne, Samuell Browne, Thomas Hutchins, William Vassall, William Pinchion, and George Foxcroft, their Heires and Assignes forevermore: To BE HOLDEN of Vs. our Heires and Successors, as of our Manor of Eastgreenwich in our Countie of Kent, within our Realme of England, in free and comon Soccage, and not in Capite, nor by Knights Service; and also yeilding and paying therefore, to Vs. our Heires and Sucessors, the fifte Parte onlie of all Oare of Gould and Silver, which from tyme to tyme, and at all tymes hereafter, shal be there gotten, had, or obteyned, for all Services, Exaccons, and Demaundes whatsoever; PROVIDED alwaies, and our expresse Will and Meaninge is, that onlie one fifte Parte of the Gould and Silver Oare above mencoed, in the whole, and noe more be reserved or payeable vnto Vs. our Heires and Successors, by Collour or Vertue of theis Presents, the double Reservacons or rentals aforesaid or any Thing herein conteyned notwithstanding. AND FORASMUCH, as the good and prosperous Successe of the Plantacon of the saide Partes of Newe-England aforesaide intended by the said Sir Henry Rosewell, Sir John Younge, Sir Richard Saltonstall, Thomas Southcott, John Humfrey, John Endecott, Simon Whetcombe, Isaack Johnson, Samuell Aldersey John Ven, Mathew Cradock, George Harwood, Increase Noell, Richard Pery, Richard Bellingham, Nathaniell Wright, Samuell Vassall, Theophilus Eaton, Thomas Goffe, Thomas Adams, John Browne, Samuell Browne, Thomas Hutchins, William Vassall, William Pinchion, and George Foxcrofte, to be speedily sett vpon, cannot but cheifly depend, next vnder the Blessing of Almightie God, and the support of our Royall Authoritie vpon the good Government of the same, To the Ende that the Affaires and Buyssinesses which from tyme to tyme shall happen and arise concerning the saide Landes, and the Plantation of the same maie be the better mannaged and ordered, WEE HAVE FURTHER hereby of our especial Grace, certain Knowledge and mere Mocon, Given, graunted and confirmed, and for Vs. our Heires and Successors, doe give, graunt, and confirme vnto our said trustie and welbeloved subjects Sir Henry Rosewell, Sir John Younge, Sir Richard Saltonstall, Thomas Southcott, John Humfrey, John Endicott, Simon Whetcombe, Isaack Johnson, Samuell Aldersey, John Yen, Mathewe Cradock, George Harwood, Increase Nowell, Richard Pery, Richard Bellingham, Nathaniell Wright, Samuell Vassall, Theophilus Eaton, Thomas Goffe, Thomas Adams, John Browne, Samuell Browne, Thomas Hutchins, William Vassall, William Pinchion, and George Foxcrofte: AND for Vs. our Heires and Successors, Wee will and ordeyne, That the saide Sir Henry Rosewell, Sir John Young, Sir Richard Saltonstall, Thomas Southcott, John Humfrey, John Endicott, Svmon Whetcombe, Isaack Johnson, Samuell Aldersey, John Ven, Mathewe Cradock, George Harwood, Increase Noell, Richard Pery, Richard Bellingham, Nathaniell Wright, Samuell Vassall, Theophilus Eaton, Thomas Goffe, Thomas Adams, John Browne, Samuell Browne, Thomas Hutchins, William Vassall, William Pinchion, and George Foxcrofte, and all such others as shall hereafter be admitted and made free of the Company and Society hereafter mencoed, shall from tyme to tyme, and att all tymes forever hereafter be, by Vertue of theis presents, one Body corporate and politique in Fact and Name, by the Name of the Governor and Company of the Mattachusetts Bay in Newe-England, and them by the Name of the Governour and Company of the Mattachusetts Bay in Newe-England, one Bodie politique and corporate, in Deede, Fact, and Name; Wee doe for vs. our Heires and Successors, make, ordoyne, constitute, and confirme by theis Presents, and that by that name they shall have perpetuall Succession, and that by the same Name they and their Successors shall and maie be capeable and enabled aswell to implead, and to be impleaded, and to prosecute, demaund, and aunswere, and be aunsweared veto, in all and singuler Suites, Causes, Quarrells, and Accons, of what kinde or nature soever. And also to have, take, possesse, acquire, and purchase any Landes, Tenements, or Hereditaments, or any Goodes or Chattells, and the same to lease, graunte, demise, alien, bargaine, sell, and dispose of, as other our liege People of this our Realme of England, or any other corporacon or Body politique of the same may lawfully doe. PROVIDED alsoe, and our Will and Pleasure is, That aswell such as are by theis Presents appointed to be the present Governor, Deputie Governor, and Assistants of the said Company, as those that shall Succeed them, and all other Officers to be appointed and chosen as aforesaid, shall, before they undertake the Execucon of their saide Offices and Places respectivelie, take their Corporal Oathes for the due and faithfull Performance of their Duties in their severall Offices and Places, before such Person or Persons as are by theis Presents hereunder appointed to take and receive the same; That is to saie, the saide Mathewe Cradock, whoe is hereby nominated and appointed the present Governor of the saide Company, shall take the saide Oathes before one or more of the Masters of our Courte of Chauncery for the Tyme being, vnto which Master or Masters of the Chauncery, Wee doe by theis Presents give full Power and Authoritie to take and administer the said Oathe to the said Governor accordinglie: And after the saide Governor shalbe soe sworne, then the said Deputy Governor and Assistants, before by theis Presents nominated and appointed, shall take the said severall Oathes to their Offices and Places respectivelie belonging, before the said Mathew Cradock, the present Governor, soe formerlie sworne as aforesaide. And every such person as shall be at the Tyme of the annuall Eleccon, or otherwise, vpon Death or Removeall, be appointed to be the newe Governor of the said Company, shall take the Oathes to that Place belonging, before the Deputy Governor, or two of the Assistants of the said Company at the least, for the Tyme being: And the newe elected Deputie Governor and Assistants, and all other officers to be hereafter chosen as aforesaide from Tyme to Tyme, to take the Oathes to their places respectivelie belonging, before the Governor of the said Company for the Tyme being, vnto which said Governor, Deputie Governor, and assistants, Wee doe by theis Presents Give full Power and Authoritie to give and administer the said Oathes respectively, according to our true Meaning herein before declared, without any Comission or further Warrant to be had and obteyned of our Vs. our Heires or Successors, in that Behalf. AND, Wee doe further, of our especial Grace, certen Knowledge, and meere mocon, for Vs. our Heires and Successors, give and graunte to the said Governor and Company, and their Successors for ever by theis Presents, That it shalbe lawfull and free for them and their Assignes, at all and every Tyme and Tymes hereafter, out of any our Realmes or Domynions whatsoever, to take, leade, carry, and transport, for in and into their Voyages, and for and towardes the said Plantacon in Newe England, all such and soe many of our loving Subjects, or any other strangers that will become our loving Subjects, and live under our Allegiance, as shall willinglie accompany them in the same Voyages and Plantacon; and also Shippmg, Armour, Weapons, Ordinance, Municon, Powder, Shott, Come, Victualls, and all Manner of clothing, Implements, Furniture, Beastes, Cattle, Horses, Mares, Merchandizes, and all other Thinges necessarie for the saide Plantacon, and for their Vse and Defence, and for Trade with the People there, and in passing and returning to and fro, any Lawe or Statute to the contrarie hereof in any wise notwithstanding; and without payeing or yeilding any Custome or Subsidie, either inward or outward, to Vs. our Heires or Successors, for the same, by the Space of seaven Yeares from the Day of the Date of theis Presents. PROVIDED, that none of the saide Persons be such as shalbe hereafter by especiall Name restrayned by Vs. our Heires or Successors. AND, for their further Encouragement, of our especiall Grace and Favor, Wee doe by theis Presents, for Vs. our Heires and Successors, yeild and graunt to the saide Governor and Company, and their Successors, and every of them, their Factors and Assignes, That they and every of them shalbe free and quits from all Taxes, Subsidies, and Customes, in Newe England, for the like Space of seaven Yeares, and from all Taxes and Imposicons for the Space of twenty and one Yeares, vpon all Goodes and Merchandizes at any Tyme or Tymes hereafter, either vpon Importacon thither, or Exportacon from thence into our Realme of England, or into any other our Domynions by the said Governor and Company, and their Successors, their Deputies, Factors, and Assignes, or any of them; EXCEPT onlie the five Pounds per Centum due for Custome vpon all such Goodes and Merchandizes as after the saide seaven Yeares shalbe expired, shalbe brought or imported into our Realme of England, or any other of our Dominions, according to the auncient Trade of Merchants, which five Poundes per Centum onlie being paide, it shall be thenceforth lawfull and free for the said Adventurers, the same Goodes and Merchandizes to export and carry out of our said Domynions into forraine Partes, without any Custome, Tax or other Dutie to be paid to Vs. our Heires or Successors, or to any other Officers or Ministers of Vs. our Heires and Successors. PROVIDED, that the said Goodes and Merchandizes be shipped out within thirteene Monethes, after their first Landing within any Parte of the saide Domynions. AND, Wee doe for Vs. our Heires and Successors, give and graunte vnto the saide Governor and Company, and their Successors, That whensoever, or soe often as any Custome or Subsedie shall growe due or payeable vnto Vs our Heires, or Successors, according to the Lymittacon and Appointment aforesaide, by Reason of any Goodes, Wares, or Merchandizes to be shipped out, or any Retorne to be made of any Goodes, Wares, or Merchandize vnto or from the said Partes of Newe England hereby moncoed to be graunted as aforesaid, or any the Landes or Territories aforesaide, That then, and soe often, and in such Case, the Farmors, Customers, and Officers of our Customes of England and Ireland, and everie of them for the Tyme being, vpon Request made to them by the saide Governor and Company, or their Successors, Factors or Assignes, and vpon convenient Security to be given in that Behalf, shall give and allowe vnto the said Governor and Company, and their Successors, and to all and everie Person and Persons free of that Company, as aforesaide, six Monethes Tyme for the Payement of the one halfe of all such Custome and Subsidy as shalbe due and payeable unto Vs. our Heires and Successors, for the same; for which theis our Letters patent, or the Duplicate, or the inrollemt thereof, shalbe vnto our saide Officers a sufficient Warrant and Discharge. NEVERTHELESS, our Will and Pleasure is, That yf any of the saide Goodes, Wares, and Merchandize, which be, or shalbe at any Tyme hereafter landed or exported out of any of our Realmes aforesaide, and shalbe shipped with a Purpose not to be carried to the Partes of Newe England aforesaide, but to some other place, That then such Payment, Dutie, Custome, Imposicon, or Forfeyfure, shalbe paid, or belonge to Vs. our Heires and Successors, for the said Goodes, Wares, and Merchandize, soe fraudulently sought to be transported, as yf this our Graunte had not been made nor graunted. AND, Wee doe further will, and by theis Presents, for Vs. our Heires and Successors, firmlie enioine and comaunde, as well the Treasorer, Chauncellor and Barons of the Exchequer, of Vs. our Heires and Successors, as also all and singuler the Customers, Farmors, and Collectors of the Customes, Subsidies, and Imposts and other the Officers and Ministers of Vs our Heires and Successors whatsoever, for the Tyme Being, That they and every of them, vpon the strewing forth vnto them of theis Letters patents, or the Duplicate or exemplificacon of the same, without any other Writt or Warrant whatsoever from Vs. our Heires or Successors, to be obteyned or sued forth, doe and shall make full, whole, entire, and due Allowance, and cleare Discharge vnto the saide Governor and Company, and their Successors, of all Customes, Subsidies, Imposicons, Taxes and Duties whatsoever, that shall or maie be claymed by Vs. our Heires and Successors, of or from the said Governor and Company, and their Successors, for or by Reason of the said Goodes, Chattels, Wares, Merchandizes, and Premises to be exported out of our saide Domynions, or any of them, into any Parte of the saide Landes or Premises hereby mencoed, to be given, graunted, and confirmed, or for, or by Reason of any of the saide Goodes, Chattells, Wares, or Merchandizes to be imported from the said Landes and Premises hereby mencoed, to be given, graunted, and confirmed into any of our saide Dominions, or any Parte thereof as aforesaide, excepting onlie the saide five Poundes per Centum hereby reserved and payeable after the Expiracon of the saide Terme of seaven Yeares as aforesaid, and not before: And theis our Letters-patents, or the Inrollment, Duplicate, or Exemplificacon of the same shalbe for ever hereafter, from time to tyme, as well to the Treasorer, Chauncellor and Barons of the Exchequer of Vs. our Heires and Successors, as to all and singuler the Customers, Farmors, and Collectors of the Customes, Subsidies, and Imposts of Vs. our Heires and Successors, and all Searchers, and other the Officers and Ministers whatsoever of Vs. our Heires and Successors, for the Time being, a sufficient Warrant and Discharge in this Behalf. AND, further our Will and Pleasure is, and Wee doe hereby for Vs. our Heires and Successors, ordeyne and declare, and graunte to the saide Governor and Company, and their Successors, That all and every the Subiects of Vs. our Heires or Successors, which shall goe to and inhabite within the saide Landes and Premisses hereby mencoed to be graunted, and every of their Children which shall happen to be borne there, or on the Seas in goeing thither, or returning from thence, shall have and enjoy all liberties and Immunities of free and naturall Subiects within any of the Domynions of Vs. our Heires or Successors, to all Intents, Construccons, and Purposes whatsoever, as yf they and everie of them were borne within the Realme of England. And that the Governor and Deputie Governor of the said Company for the Tyme being, or either of them, and any two or more of such of the saide Assistants as shalbe therevnto appointed by the saide Governor and Companv at any of their Courts or Assemblies to be held as aforesaide, shall and maie at all Tymes, and from tyme to tyme hereafter, have full Power and Authoritie to minister and give the Oathe and Oathes of Supremacie and Allegiance, or either of them, to all and everie Person and Persons, which shall at any Tyme or Tymes hereafter goe or passe to the Landes and Premisses hereby mencoed to be graunted to inhabite in the same. AND, Wee doe of our further Grace, certen Knowledg and meere Mocon, give and graunte to the saide Governor and Companv, and their Successors, That it shall and male be lawfull, to and for the Governor or Deputie Governor, and such of the Assistants and Freemen of the said Company for the Tyme being as shalbe assembled in any of their generall Courts aforesaide, or in any other Courtes to be specially sumoned and assembled for that Purpose, or the greater Parte of them (whereof the Governor or Deputie Governor, and six of the Assistants to be alwaies seaven) from tyme to tyme, to make, ordeine, and establishe all Manner of wholesome and reasonable Orders, Lawes, Statutes, and Ordilmces, Direccons, and Instruccons, not contrairie to the Lawes of this our Realme of England, aswell for selling of the Formes and Ceremonies of Governmt and Magistracy fitt and necessary for the said Plantacon, and the Inhabitants there, and for nameing and setting of all sorts of Officers, both superior and inferior, which they shall finde needefull for that Governement and Plantacon, and the distinguishing and setting forth of the severall duties, Powers, and Lymytts of every such Office and Place, and the Formes of such Oathes warrantable by the Lawes and Statutes of this our Realme of England, as shalbe respectivelie ministred vnto them for the Execucon of the said severall Offices and Places; as also, for the disposing and ordering of the Eleccons of such of the said Officers as shalbe annuall, and of such others as shalbe to succeede in Case of Death or Remove all and ministering the said Oathes to the newe elected Officers, and for Imposicons of lawfull Fynes, Mulcts, Imprisonment, or other lawfull Correccon, according to the Course of other Corporacons in this our Realme of England, and for the directing, ruling, and disposeing of all other Matters and Thinges, whereby our said People, Inhabitants there, may be soe religiously, peaceablie, and civilly governed, as their good Life and orderlie Conversacon, maie wynn and incite the Natives of Country, to the KnowIedg and Obedience of the onlie true God and Saulor of Mankinde, and the Christian Fayth, which in our Royall Intencon, and the Adventurers free Profession, is the principall Ende of this Plantacion. WILLING, comaunding, and requiring, and by theis Presents for Vs. our Heiress Successors, ordoyning and appointing, that all such Orders, Lawes, Statuts and Ordinnces, Instruccons and Direccons, as shalbe soe made by the Governor, or Deputie Governor of the said Company, and such of the Assistants and Freemen as aforesaide, and published in Writing, under their comon Seale, shalbe carefullie and duly observed, kept, performed, and putt in Execucon, according to the true Intent and Meaning of the same; and theis our Letters-patents, or the Duplicate or exemplificacon thereof, shalbe to all and everie such Officers,-superior and inferior, from Tyme to Tyme, for the putting of the same Orders, Lawes, Statutes, and Ordinuces, Instruccons, and Direccons, in due Execucon against Vs. our Heires and Successors, a sufficient Warrant and Discharge. AND WEE DOE further, for Vs. our Heires and Successors, give and graunt to the said Governor and Company, and their Successors bv theis Presents, that all and everie such Chiefe Comaunders, Captaines, Governors, and other Officers and Ministers, as by the said Orders, Lawes, Statuts, Ordinnces, Instruccons, or Direccons of the said Governor and Company for the Tyme being, shalbe from Tyme to Tyme hereafter vmploied either in the Government of the saide Inhabitants and Plantacon, or in the Waye by Sea thither, or from thence, according to the Natures and Lymitts of their Offices and Places respectively, shall from Tyme to Tyme hereafter for ever, within the Precincts and Partes of Newe England hereby mencoed to be graunted and confirmed, or in the Waye by Sea thither, or from thence, have full and Absolute Power and Authoritie to correct, punishe, pardon, governe, and rule all such the Subiects of Vs. our Heires and Successors, as shall from Tyme to Tyme adventure themselves in any Voyadge thither or from thence, or that shall at any Tyme hereafter, inhabite within the Precincts and Partes of Newe England aforesaid, according to the Orders, Lawes, Ordinnces, Instruccons, and Direccons aforesaid, not being repugnant to the Lawes and Statutes of our Realme of England as aforesaid. AND WEE DOE further, for Vs. our Heires and Successors, give and graunte to the said Governor and Company, and their Successors, by theis Presents, that it shall and maie be lawfull, to and for the Chiefe Comaunders, Governors, and officers of the said Company for the Time being, who shalbe resident in the said Parte of Newe England in America, by theis presents graunted, and others there inhabiting by their Appointment and Direccon, from Tyme to Tyme, and at all Tymes hereafter for their speciall Defence and Safety, to incounter, expulse, repell, and resist by Force of Armes, aswell by Sea as by Lande, and by all fitting Waies and Meanes whatsoever, all such Person and Persons, as shall at any Tyme hereafter, attempt or enterprise the Destruccon, Invasion, Detriment, or Annoyaunce to the said Plantation or Inhabitants, and to take and surprise by all Waies and Meanes whatsoever, all and every such Person and Persons, with their Shippes, Armour, Municons and other Goodes, as shall in hostile manner invade or attempt the defeating of the said Plantacon, or the Hurt of the said Company and Inhabitants: NEVERTHELESS, our Will and Pleasure is, and Wee doe hereby declare to all Christian Kinges, Princes and States, that yf any Person or Persons which shall hereafter be of the said Company or Plantacon or any other by Lycense or Appointment of the said Governor and Company for the Tyme being, shall at any Tyme or Tymes hereafter, robb or spoyle, by Sea or by Land, or doe any Hurt, Violence, or vnlawful Hostilitie to any of the Subjects of Vs. our Heires or Successors, or any of the Subjects of any Prince or State, being then in League and Amytie with Vs. our Heires and Successors, and that upon such injury don and vpon iust Complaint of such Prince or State or their Subjects, WEE, our Heires and Successors shall make open Proclamacon within any of the Partes within our Realme of England, comodious for that purpose, that the Person or Persons haveing comitted any such Roberie or Spoyle, shall within the Terme lymytted by such a Proclamacon, make full Restitucon or Satisfaccon of all such Iniureis don, soe as the said Princes or others so complayning, maie hould themselves fullie satisfied and contented; and that yf the said Person or Persons, haveing comitted such Robbery or Spoile, shall not make, or cause to be made Satisfaccon accordinglie, within such Tyme soe to be lymytted, that then it shalbe lawfull for Vs. our Heires and Successors, to putt the said Person or Persons out of our Allegiance and Proteccon, and that it shalbe lawfull and free for all Princes to prosecute with Hostilitie, the said Offendors, and every of them, their and every of their Procurers, Ayders, Abettors, and Comforters in that Behalf: PROVIDED also, and our expresse Will and Pleasure is, And Wee doe by theis Presents for Vs. our Heires and Successors ordeyne and appoint That theis Presents shall not in any manner envre, or be taken to abridge, barr, or hinder any of our loving subjects whatsoever, to vse and exercise the Trade of Fishing vpon that Coast of New England in America, by theis Presents mencoed to be graunted. But that they, and every, or any of them shall have full and free Power and Liberty to continue and vse their said Trade of Fishing vpon the said Coast, in any the Seas therevnto adioyning, or any Armes of the Seas or Saltwater Rivers where they have byn wont to fishe, and to build and sett vp vpon the Landes by theis Presents graunted, such Wharfes, Stages, and Workehouses as shalbe necessarie for the salting, drying, keeping, and packing vp of their Fish, to be taken or gotten vpon that Coast; and to cutt down, and take such Trees and other Materialls there groweing, or being, or shalbe needefull for that Purpose, and for all other necessarie Easements, Helpes, and Advantage concerning their said Trade of Fishing there, in such Manner and Forme as they have byn heretofore at any tyme accustomed to doe, without making any wilfull Waste or Spoyle, any Thing in theis Presents conteyned to the contrarie notwithstanding. AND WEE DOE further, for Vs. our Heires and Successors, ordeyne and graunte to the said Governor and Company, and their Successors by theis Presents that theis our Letters-patents shalbe firme, good, effectuall, and availeable in all Thinges, and to all Intents and Construccons of Lawe, according to our true Meaning herein before declared, and shalbe construed, reputed, and adjudged in all Cases most favourablie on the Behalf, and for the Benefist and Behoofe of the saide Governor and Company and their Successors: ALTHOUGH expresse mencon of the true yearely Value or certenty of the Premisses or any of them; or of any other Guiftes or Grauntes, by Vs. or any of our Progenitors or Predecessors to the foresaid Governor or Company before this tyme made, in theis-Presents is not made; or any Statute, Acte, Ordinnce, Provision, Proclamacon, or Restrainte to the contrarie thereof, heretofore had, made, published, ordeyned, or provided, or any other Matter, Cause, or Thinge whatsoever to the contrarie thereof in any wise notwithstanding.